Food service workers arrested in civil disobedience during Harvard University Strike. The 750 workers represented by UNITE HERE Local 26 walked out on Oct. 5. 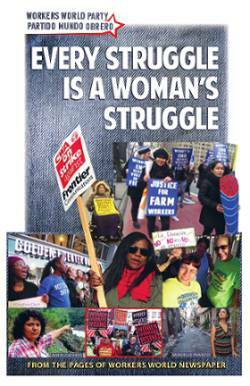 Since then, calls, emails, letters and articles of support have poured in from students, workers and faculty in South Africa, Japan, Brazil, Ireland, Russia and other European countries, as well as the U.S.
Ed Childs, chief shop steward of Local 26, who has worked at Harvard for 43 years, explains why: “Health care is a civil rights issue. The Harvard Corporation and Board of Overseers who run Harvard University are pushing an agenda to undermine preventive medical care. This is about austerity. “The affordability of health insurance plans comes down to two factors: premiums and out-of-pocket costs. How affordable are employer plans? A team of Harvard medical students compared the plan Harvard proposed for the dining workers to what would be available on the Massachusetts health exchange [set up under the Affordable Care Act to facilitate the purchase of health insurance by individuals and families]. “For a family of three earning $30,000, the Harvard plan requires an employee to contribute a premium of $233 a month, while the health exchange has plans that require no premiums at all. Harvard Medical School faculty and the World Health Organization have defined any health spending over 10 percent of annual income as a catastrophic expenditure. The Harvard plan comes perilously close to this with premiums alone. The rotten cherry on the top? Harvard’s plan also has higher co-pays than the exchange plans. The Harvard Corporation and Board of Overseers have ties to Citigroup, Goldman Sachs, Bank of America, Merck, Google, Abbott Labs and CVS, among others. Striking workers have confronted them in their offices and on campus. 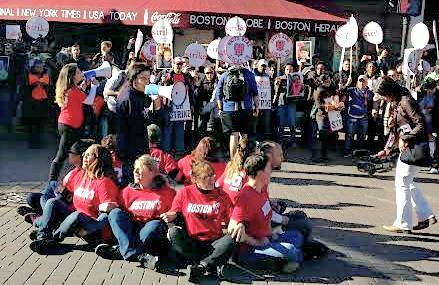 On Oct. 14, some 500 strikers and their supporters marched on Harvard Square during rush hour and shut it down. As the crowd chanted, banged drums and blew whistles, nine women strikers sat down in the middle of the street and were arrested. Also arrested were the head of Local 26 and the chief negotiator. One of the women arrested told WW that she direly needs a knee replacement and is in constant pain from standing on her feet all day. But she cannot afford the operation. When she struggled to sit down in the street, the crowd roared. The workers know that the struggle for quality health care is global and united. Local 26 strikers have supported and spoken at rallies to change Columbus Day to Indigenous Peoples’ Day, in support of Standing Rock and against pipeline spills and water poisoning. In turn, Native students at Harvard have spoken at strike rallies. HUDS strikers are holding the line for quality, affordable health care, and they’re doing it for workers and oppressed the world over who suffer from the brutalities of capitalist and imperialist profit making in sweatshops and factories, fields and fast food restaurants. Victory to the HUDS strike! Health care is a human right!